1. Purchase any of the products listed above between 08/01/2018 and 08/31/2018. 2. Go to msi.rebateaccess.com and enter the promotion number 84790. 3. Fill out and print the registration form for this promotion. 4. Cut out and enclose the ORIGINAL UPC barcode from the product box (not the UPC barcode from the shipping box). 5. Enclose a copy of the sales receipt or packing slip dated between 08/01/2018 and 08/31/2018 indicating your purchase. 6. Mail all of these items to the address noted on the registration form. Submission must be postmarked within 21 days of purchase and no later than 09/21/2018 in order to qualify. Terms and Conditions: This mail-in rebate card offer is valid only with purchases made between 08/01/2018 and 08/31/2018 on this form's listed products by an end user customer. Only the actual purchaser of the qualifying product may participate. Resellers, organizations, and groups do NOT qualify for this promotion. Limit one rebate card per product line per person, address, and household. Photocopies of the UPC will be denied unless stated on the rebate form. End user must keep copies of all materials sent. Materials received become the property of MSI. Use of fictitious names and/or multiple addresses to obtain multiple rebate card requests is fraudulent and could result in federal prosecution under the U.S. Mail fraud statutes (18 USC, Section 1341 & 1342). Reward vendor reserves the right to substitute and issue a check of equal value in lieu of a Prepaid Card at its discretion. Rebate card or check issued in U.S. Dollars. If rebate payment is less than $10 a rebate check will be issued. Checks are void if not cashed within 90 days. If rebate payment is greater than $10 a Prepaid Card will be issued. The Prepaid Card will expire 6 months from the issuance date. To check rebate status, log onto msi.rebateaccess.com or call 1-800-953-3098. Please allow 4 weeks after mailing prior to checking status. Offer is valid to residents of the 50 United States and its territories. Promotion is void where prohibited or restricted by law and non-transferable. Not valid with any other offer unless stated otherwise. Failure to submit any of the requested documentation will delay or prevent the rebate card issuance. MSI reserves the right to interpret the rules of this promotion at its sole discretion and all decisions made by MSI are final. Please allow 8-10 weeks for processing of submission. MSI is not responsible for any liabilities, taxes or expenses incurred by end user as a result of this promotion. Your right to receive the rebate will automatically terminate if you fail to negotiate your rebate card by the expiration date on it. 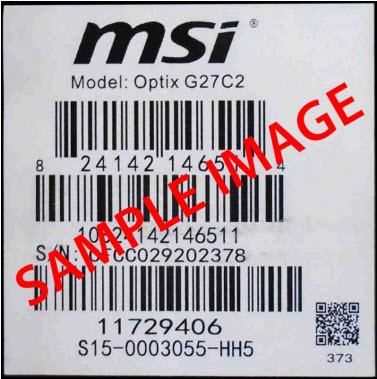 MSI products may not be returned for refund once the rebate card form has been submitted. MSI is not responsible for late, lost, misdirected or postage-due mail.